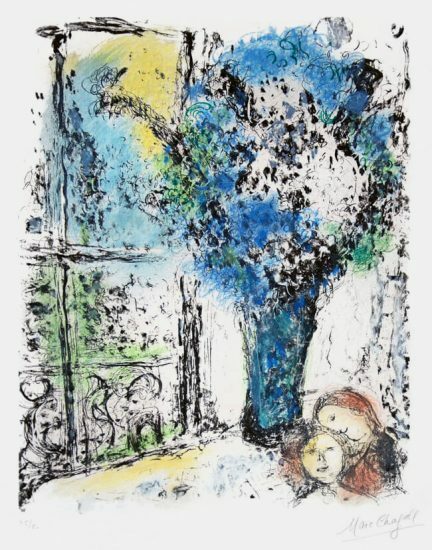 Numbered from the edition of 100 in pencil in the lower left margin; aside from the Roman numeral edition of V.
This work is hand signed by Marc Chagall (Vitebsk, 1887 – Saint-Paul, 1985) in pencil 'M. 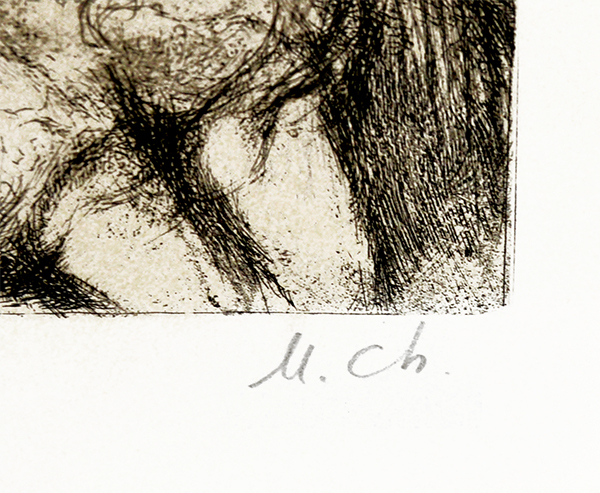 Ch.' 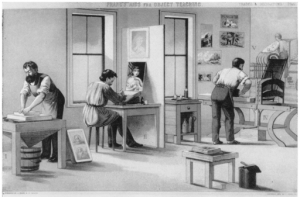 in the lower right margin. 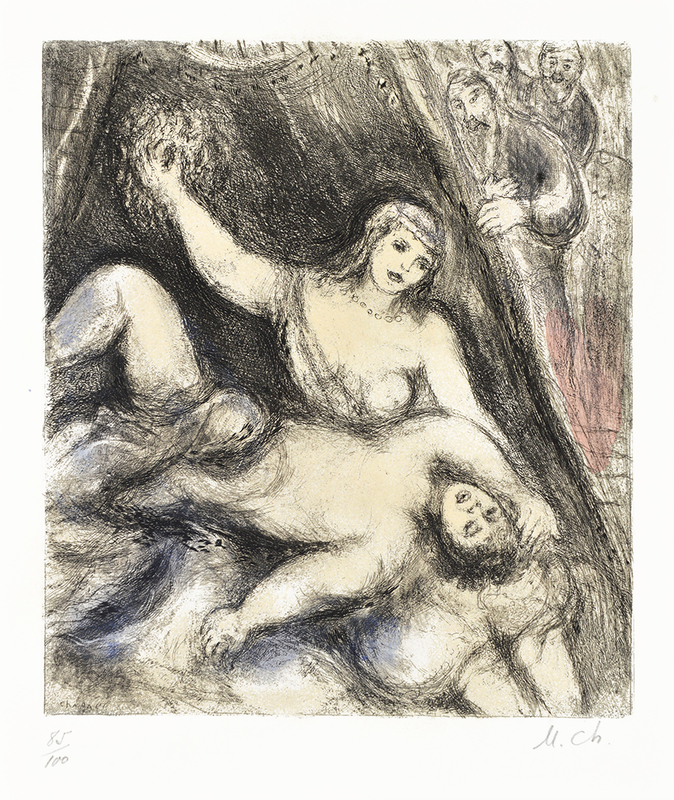 Marc Chagall Samson and Delilah (from the Bible Series), 1958 is an exquisite piece that showcases the scandalous story of Samson and Delilah. In this biblical story, the Philistines persuade Delilah, lover of Samson to find out the secret of Samson’s strength. 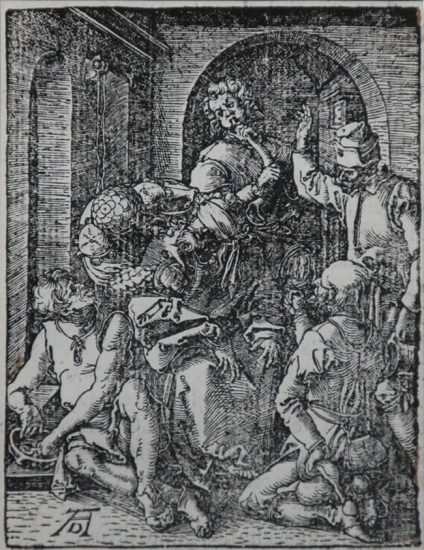 Samson, the final Judge of Israel, given supernatural strength by God, falls for Delilah’s persuasion in which he ultimately tells her that his strength comes from his hair. 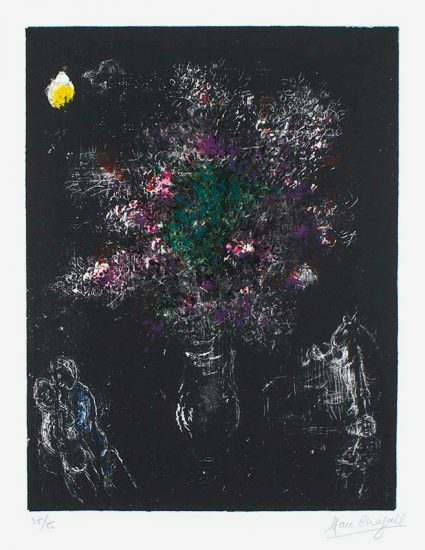 It is then that Delilah cuts off Samson’s hair in the middle of the night and he becomes captive by the Philistines. Prostitute, seductress, and villainess were titles closely attributed to Delilah. 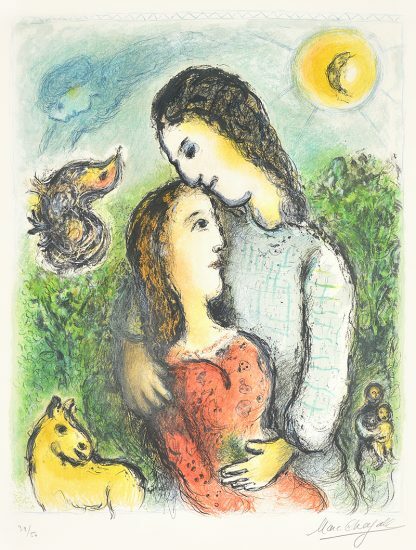 It is here that Chagall brings forth his own rendition of such an archetypal scene. 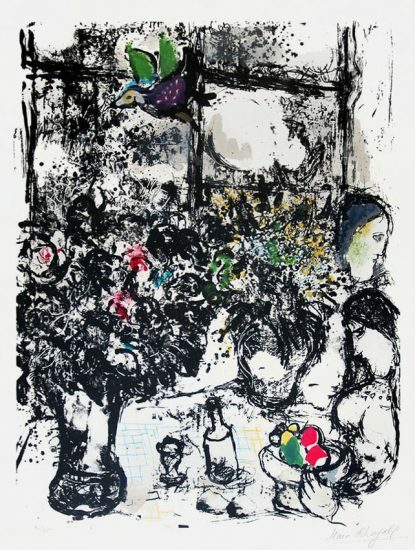 Though her body language is a common motif—her bosom displayed wide open and arm raised—what Chagall accomplishes is the exchange of complex emotions between two lovers. Samson writhes in pain, longingly looking up at his expressionless lover. There is a sense of power coming from Delilah’s hand. The blue ink that colors the lower half of Samson’s body is incredibly subtle and foreshadows his detriment. To the right, we see the cowering Philistine Lords greedily rejoicing in this victory. 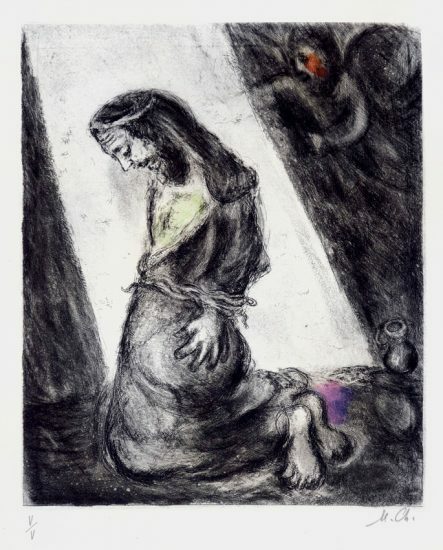 For Chagall, capturing the complexity of human tragedy was important. He allows us to feel sympathy, regret, and injustice that flow through the entire narrative. 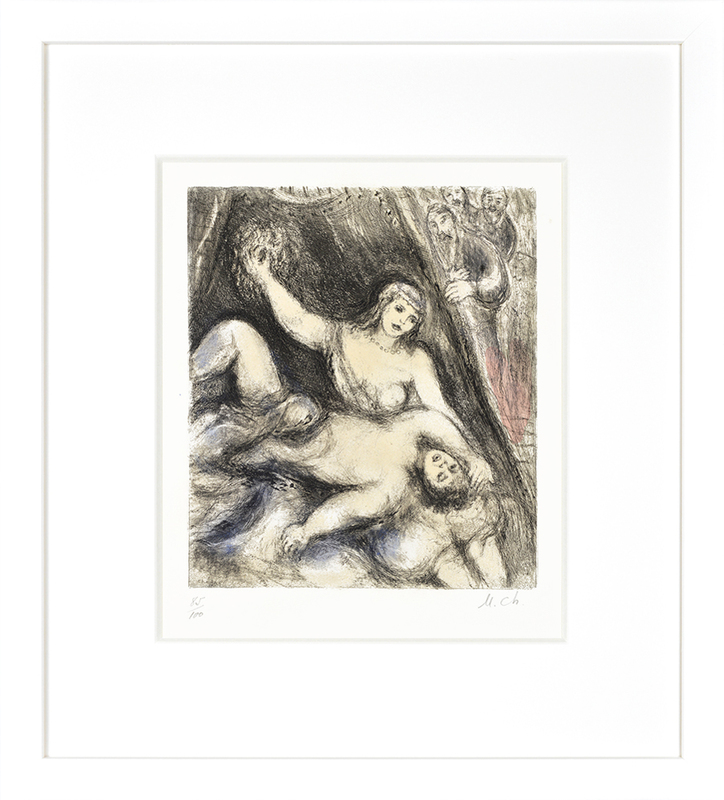 Created in 1958, Marc Chagall Samson and Delilah (from the Bible Series), 1958 is an etching with hand-applied watercolor. 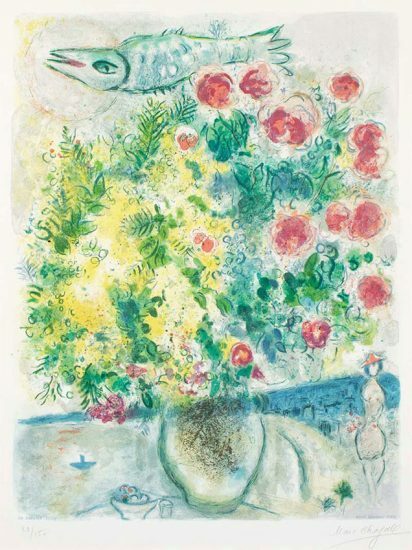 Hand signed by Marc Chagall (Vitebsk, 1887 – Saint-Paul, 1985) in pencil 'M. 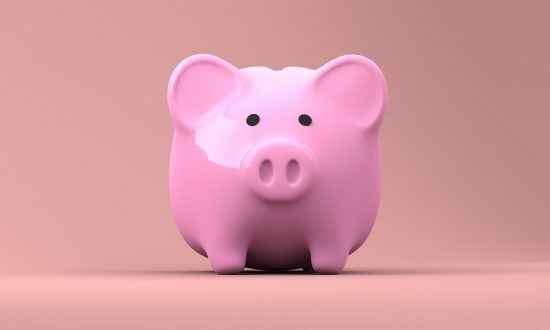 Ch.' 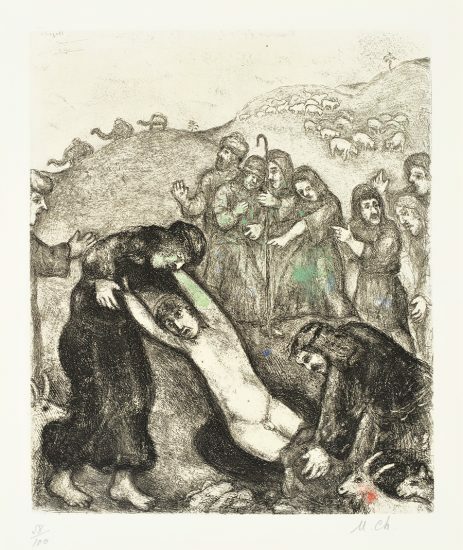 in the lower right margin, this piece is numbered from the edition of 100 in pencil in the lower left margin; aside from the Roman numeral edition of V.
Marc Chagall Samson and Delilah (from the Bible Series), 1958 is framed to museum-grade, conservation standards, presented in a complementary moulding and finished with linen-wrapped mats and optical grade Plexiglas.